Born on the Prairies, from the ravages of the Depression the Cooperative Commonwealth Federation was a new political party that offered a socialist vision and idealist belief that Canada could rebuild itself to become better and fairer. The CCF grew to the point that by 1943, a national poll found that it was Canada’s most popular party. At that point a combination of big business, the Progressive Conservative Party, and religious leaders undertook a well-financed and carefully organized campaign to discredit socialism and destroy the CCF. Into the Hurricane looks the effort to destroy the party that was promoting ideas such as universal health care and public support for education and the arts that are now a part of Canada’s identity. 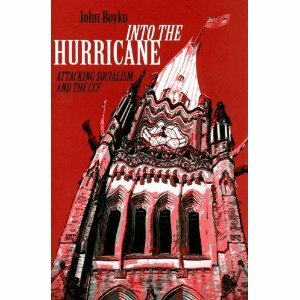 “Into the Hurricane is a brilliant and refreshing account of the troubling lengths to which power elites sought to suppress the CCF’s vision of a more equitable Canada. Boyko accurately reminds us why it is no coincidence that Tommy Douglas was voted the Greatest Canadian. The CCF prevailed, as the NDP does today, because it was the natural voice for progressive Canadian values.” – Jack Layton, Leader of Canada’s NDP. “Boyko makes effective use of the collection of newspaper clippings, advertisements, cartoons, and pamphlets found in national CCF party records. He is also the first to use the papers of two of the chief architects of this anti-CCF advertising campaign, Gladstone Murray and the Canadian Chamber of Commerce.” – Canadian Historical Review. “The strength of this volume lies in Boyko’s documentation of the extraordinary campaign undertaken by several sectors of Canadian capital to discredit the CCF. The insurance industry is a prime example.” – Labour/Le Travail.